I’m Stevie welcome to my website. I grew up fishing the creeks of Hermitage Exuma and have spent my entire life on the Island. I have guided here on Exuma for over 20 years. My start to bonefish guiding came a bit by surprise in 1983. One afternoon I was on the dock fishing and the Manager of Out Island Hotel came to pick up his guests and they needed a local to show them around the Cays. That first day guiding we caught nine Bones. 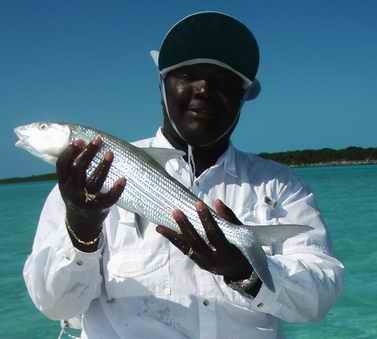 For ten years I guided for the Peace and Plenty Bonefish Lodge and now operate as an independent fishing guide. I’m also available for deep sea, reef, and fly fishing instruction. I’m a certified Bonefish guide and also have CPR and first aid training. I understand everyone has a different fishing style and preferences and will work with you to make your days on the water the most enjoyable and productive. With a laid back approach I’ve had the pleasure of guiding high profile clients, master fisherman, and first timer's. I have the guiding experience to be very attentive to your needs. I’ll be waiting for your call.